While groundwater is the clean, beautiful water under our feet that can be tapped for drinking water, there are many other sources of fresh water across the planet. The others are not as filtered and clean. Bodies of water such as lakes, rivers, and reservoirs are collections of fresh water across the surface of the land. These sources of water can eventually percolate into the groundwater, evaporate back into the atmosphere, or flow back into the oceans and seas. Who are we kidding? Lakes are just super big puddles. Seriously, that's not fair. Lakes are enormous holding areas of freshwater. Some lakes are situated in mountain areas where snow from the surrounding mountains drains into one area. The mountains form a bowl where water pools up. When the lake reaches a certain level, the water spills out and flows down the side of the mountain as a river or stream. Rivers, creeks, and streams are similar but have different names because of their sizes. 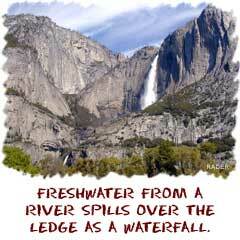 A stream can be a trickle of water moving through a forest after it rains. The other end of the spectrum is rivers such as the Mississippi or the Nile. These examples are huge rivers that are constantly flowing into the ocean. Streams often merge into larger streams and rivers. The point of these types of freshwater is to direct runoff water from higher elevations to lower elevations and eventually the ocean (sometimes a lake or reservoir). Not all collections of fresh water sources are created by nature. There was a need to collect and save as much fresh water as possible as civilization grew. 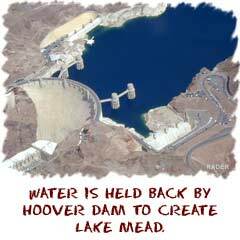 Reservoirs were invented to serve that need. They are huge containers that are man-made lakes. When the rainy season comes, the water collects and is stored. During the dry season, there is plenty of water. Humans have also used smaller devices to collect water called water towers. If you ever need to make a reservoir, you need a dam that will stop water from running out of a valley. Instead of draining to lower elevations, the water will fill the valley. China is currently building the largest dam in history.